Lemon Balm/Melissa was dedicated to the goddess Diana, and used medicinally by the Greeks some 2,000 years ago. In the Middles Ages lemon balm was used to soothe tension, to dress wounds, and as a cure for toothache, skin eruptions, mad dog bites, crooked necks, and sickness during pregnancy. It was even said to prevent baldness. As a medicinal plant, lemon balm has traditionally been employed against bronchial inflammation, earache, fever, flatulence, headaches, high blood pressure, influenza, mood disorders, palpitations, toothache and vomiting. A tea made from Lemon balm leaves is said to soothe menstrual cramps and helps relieve PMS. Properties: anti-bacterial, anti-oxidant, anti-spasmodic, anti-viral, aromatic, carminative, cerebral stimulant, diaphoretic, digestive, emmenagogue, febrifuge, nervous restorative, spasmolytic, sedative (mild), tonic. Lemon balm is widely used to treat anxiety and insomnia in Europe. It reduces anxiety and stress and eases sleep disorders. Recently it produced an unexpected result in a research study: it greatly increased the ability to concentrate and perform word and picture tasks. Several studies have used Lemon balm, and Lemon balm/Valerian combinations to treat stress, anxiety and insomnia. The studies have shown improved sleep patterns and reduced stress and anxiety. In one study a Lemon balm/Valerian combination was found to be as effective as the prescription drug Halcion. Lemon balm is approved for “nervous sleeping disorders” and “functional gastrointestinal complaints” by Commission E of the German Federal Institute for Drugs and Medical Devices. Commission E is the German governmental agency that evaluates the safety and effectiveness of herbal products. Bastyr University’s Materia Medica describes lemon balm’s ability to relax smooth muscle, which explains why lemon balm can help with muscle spasms in your gastrointestinal tract. According to Simon Mills and Kerry Bone, authors of “Principles and Practice of Phytotherapy: Modern Herbal Medicine,” you can take lemon balm for nervous dyspepsia, colic, flatulence, irritable bowel disease and gastritis. Lemon balm is a carminative, or a botanical that reduces or prevents gas. According to the University of Michigan Health System, the terpenes–the constituent of lemon balm that produces the plant’s pleasant smell–are responsible for this herb’s relaxing and gas-relieving effects. A choloretic stimulates production of bile in your liver. Bile is stored in your gall bladder and then released to your small intestine to digest fats. Choloretics, such as lemon balm, can help you with liver and gall bladder problems, such as stones and congestion or “attacks,” along with difficulty and discomfort digesting fatty meals. It is thought that the volatile oils in lemon balm contain chemicals that relax muscles, particularly in the bladder, stomach, and uterus, thereby relieving cramps, gas, and nausea. You can find lemon balm in several forms, including loose-leaf teas, capsules or tincture. You can prepare lemon balm tea by steeping 1 tsp. to 1 tbsp. of dried lemon balm leaves in hot water. Consider taking 300 to 500 mg of the capsules or 40 to 60 drops of tincture. You will find lemon balm tea, capsules or tinctures, either alone or in combination, at health food stores or at the offices of many herbalists and naturopathic doctors. To reduce indigestion, flatulence or bloating, the University of Maryland Medical Center recommends you take lemon balm, in any of the above forms, three to four times daily. 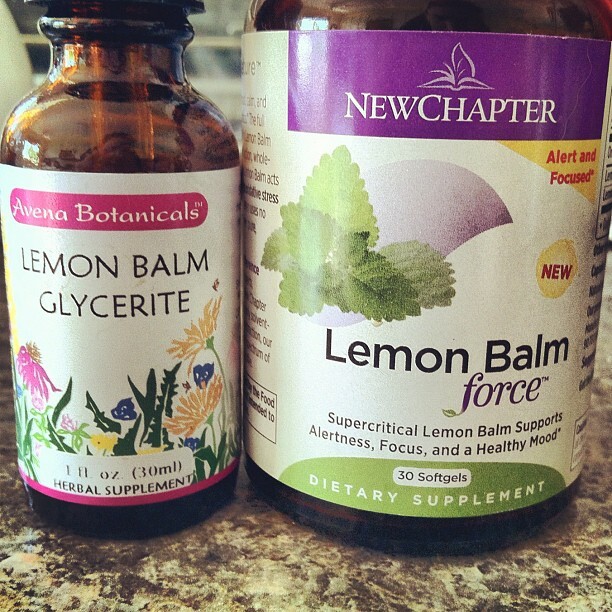 I have been taking Lemon Balm for about a month now in a few different ways. I have a tincture and I also have it in capsules. I find that the tincture works a lot better and faster for digestive complaints where as the capsules seem to be more helpful to take for insomnia if taken an hour before bed. It’s really been a life saver for anxiety and stomach upset. I find that I have been having a lot less intestinal spasms and anxiety attacks when I take the Lemon Balm regularly. If you suffer from Anxiety, Insomnia or any type of digestive issue I would highly recommend looking into Lemon Balm and seeing if it works for you!